With the festive Christmas season coming to a close and 2011 coming to an end tomorrow, Little Adrian has been in pressie receiving and giving mode – Master Adrian has been in pressie mode too. The greatest gift that we have given to each other these past few weeks is that Master Adrian has been ‘very present’ (every pun intended). He has been decisive, in control, standing in his power and allowing Little Adrian to kick back, have some fun and be a boy. As I enter into 2012 I have a mission to be 100% Master Adrian and allow Little Adrian to be free of all adult responsibility. A big call I know. However, it is the call I am making and one that I will try to live up to. If I can step into this one and accomplish my mission, I feel that anything in the world is possible. If we can master our ‘inner children, our old reactive selves and become responsible, present and more fully aware adults, what an amazing world we can create. So, that is my mission for 2012. I want to stand in my full adult power and take full responsibility for my thoughts, feelings and actions. Sound fruity? Not as fruity as the cake that we baked today. 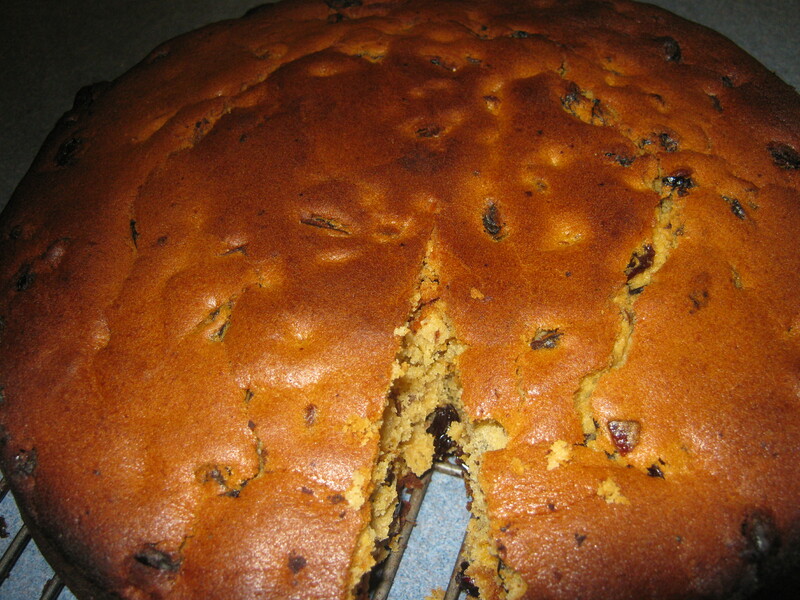 Today we baked a Rich Fruit Cake. Ingredients: 3 eggs, 150grams of sugar, 200grams of butter, 5 drops of vanilla essence, 100 mls of water, 350 grams of self raising flour, 400 grams of mixed fruit, a pinch of nut meg, cinnamon and all spice. Method: Prepare the fruit by soaking it in warm water for at least 20 minutes after mixing it with 1 teaspoon of cinnamon, allspice, nutmeg and ginger. Drain of the water before adding to cake mixture. Mix the eggs, sugar, butter, vanilla essence and water together with a mixer for 2 minutes. Add the flour and mix well for 2 minutes. Add the mixed fruit mixture and stir in with a spoon. Place into lined cake tin. Bake for approximately 45 minutes at 170 degrees – I covered the top with a tray for the last 15 minutes. Take out of the oven and cool in the tin for 10 minutes before turning out onto cooling rack. Then eat! Little Adrian has had a wonderful week. He has been free of being the boss, the leader, the decision maker, the surrogate adult and the boy- man. Master Adrian stepped in and stepped up to do what he was supposed to do; be the advocate and the hand holder for Little Adrian. On the weekend we spent two nights out in the bush. Master Adrian was celebrating his relationship anniversary, with his wife Arleen, and really did not want little Adrian in the way, so he really had to make sure that his mastery was in place – and he was. It was a great weekend and being present, in my mastery and in control was wonderful. It meant that Arleen and I could be two adults together in a space of deep communication, connection and synergy. Being out in nature as two adults, with no children, both our own and our inner children, was a powerful experience. Sitting around the camp fire in deep communication discussing adult themes and topics without the reactions, projections, judgements, fears and doubts of our inner children was a relief and a blessing. As I research, study and experience the workings of the Inner Child, more and more, I become even more aware of when people’s, inner, old selves, can, and do, take control. Conversing with people and/or observing their (and even my own) reactions, projections, judgements, fears, doubts, hurts, wounds and beliefs, is a great gift, as it allows me to be more fully present to the experience or situation. With Master Adrian being in his mastery and being more conscious, it allows Little Adrian to be the boy. What a gift! My wish for all of us in 2012 is to work on mastering the adult self and to allow the inner, younger selves to be free of being burdened with this responsibility. Today is our son’s 18th birthday – 18 being the bridge (or one of them) from boyhood to manhood. To celebrate this, I would like to offer you a slice of our son’s 18th birthday cake. A yummy chocolate orange cake. Ingredients: 3 eggs, 350 grams of self-raising flour, 1 level teaspoon bicarbonate of soda, 200 grams sugar, 100 grams butter, 120 mils of milk, 50 grams of grated chocolate, the juice from 1/4 of of an orange, grated orange rind from 1/4 orange. Method: Mix the milk, eggs, butter, chocolate and sugar, orange juice and rind with a mixer for 1 minute. Then add bi-carb and flour and mix for 2 minutes. Place into baking tin and bake for 30 – 40 minutes at 180 degrees. And then eat! Little Adrian has had an exciting week. He has been looking after two young fledgling currawongs. For those of you outside of Australia, currawongs are a bit like crows, rooks, magpies and jackdaws. They make an amazing cawing noise. The two ‘babies’ are so cute. They have almost doubled in size in one week. This is not surprising considering what they eat. They have eaten 500 grams of minced meat in almost a week and are now eating lots of worms, strawberries, mango and rice. It takes little Adrian back to when he was living in the Cotswold’s in England’s West-country. He looked after many birds and animals that he found and/or rescued. He looked after magpies, pigeons, a seagull, a budgie , frogs, lizards, snakes, mice and once, he even looked after an owl. So all week Little Adrian has been both the nurturer and the nurtured. He has been in a place of nurture, love and gratitude. Meanwhile Master Adrian has been alongside him, watching and caring and also feeling both the nurturer and the nurtured. He has also been preparing for 2012, writing up new aspects of his business. How easy life is when the boy can the a boy and the man can be the man. When the roles get confused and mixed up, that is when the problems come in. That is when the roles get muddled and no-ones knows who is who anymore. To top the week we made a cake tonight. It is called the Red Flag cake. it is not actually red, it is actually a pink colour. However, it is called the Red Flag cake because the two Adrian’s had fun with a new discovery today – the Red Flags on the email tool bar! Yes, I know, everyone knew about that. well apparently not – we only found it today. And what fun we had flagging! 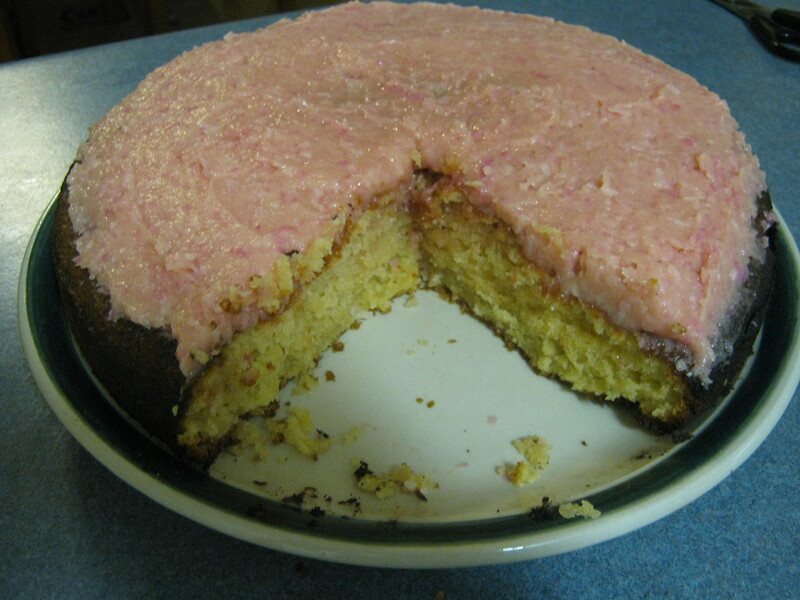 So the Red Flag cake – (also known as a Pink Moist Coconut cake) is cooling as I type, ready for the topping to be put on top. We are looking forward to the next couple of weeks and of course all the fun that the Christmas season brings for us. We really try to hold the spirit of Christmas and this year are really trying not to get caught up in all the commercial hype. We think that the currawongs might even get a special gift too. And now it is ready- and it tastes yummy! You can see that it has already been attacked! Method: Mix the butter and the sugar until blended. Add the eggs and beetroot juice and milk and mix until well blended. Add flour and coconut and mix in well and mix with mixer for about two minutes. Topping: 150 grams butter, 50 grams of shredded (or dessicated) coconut, 100 grams of icing sugar, 2 teaspoons of beetroot juice. Mix well until smooth. This can be made whilst the cake is in the oven. 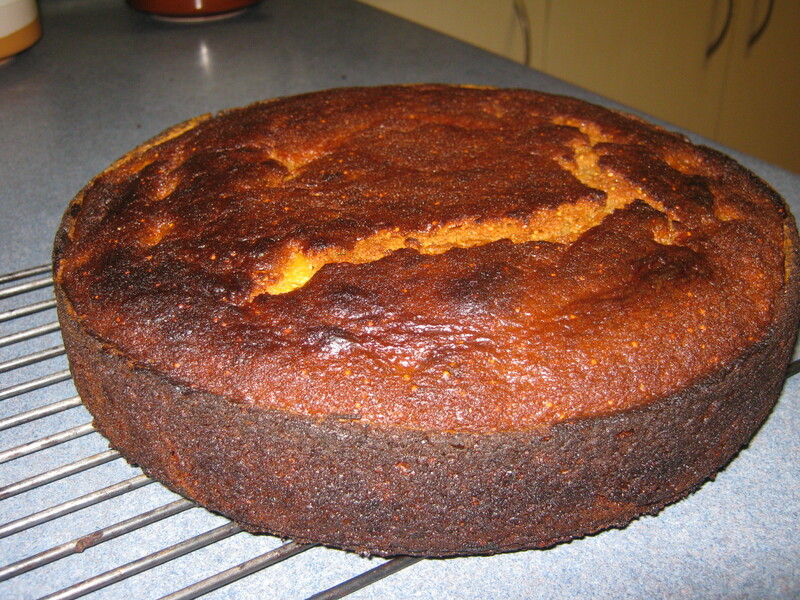 Put cake mixture into buttered(greased) cake tin and bake for approximately 30 minutes at 180degrees. Cool in the tin for a few minutes and then cool on a wire rack. When cool add the topping – and then eat! Boys (and girls) just love to play – when they are given the time and the space to do so. This week Little Adrian has been playing and having lots of fun. Although, through the eyes of the world, it may have looked as if Master Adrian was the one orchestrating it all, it was in fact Little Adrian who was really driving it. He was the one asking and demanding that this week be a week of fun and play. Master Adrian may have been the one to pull it all together, as is his responsibility, but Little Adrian was the boss this week. Master Adrian was simply following orders. What a relief. What a blessing. How wonderful that Little Adrian was able to be heard and understood and even honoured with his needs. One of the ways that little Adrian and Master Adrian get to spend time with each other is in ‘The Shed’. They love playing with timber and creating. This week they spent several hours making things in the shed at the back of the property. Much of the time Little Adrian was filled with memories of his time in his uncles carpentry workshop; where the aroma of wood, the feel of the wood shavings and the feel of the smooth polished wooden items were once again alive with him. Meanwhile, Master Adrian was happy being in his own space creating pendulums and didgeridoos, sanding, cutting, polishing and waxing. Spending time with my inner child(ren) has become an essential part of my life and my healing. The more that I work with people in personal and professional development, the more I realise and share the importance of connecting with our inner children. By recognising them, and working with them, we free both the inner children and our current aged self. That in itself is very empowering! So, what cake have we got this week to share across the planet? This week’s cake is a Fig cake. I love figs and thought that I would make a cake with the few figs that were sitting in the fridge. If you cannot find figs you can replace them with dates, or even sultanas. It will not be the same but will still be yummy. I made this recipe up as I went along and it came out just wonderful. Ingredients: 200 grams butter, 180 grams (castor) sugar, 3 eggs, 250 grams self-raising flour, 1 teaspoon bicarbonate of soda, 300 grams of figs, I good tablespoon of jam (any flavour, I used rosehip) 1 good tablespoon of honey, 250 mls of milk. Method: Soak the figs in hot water for an hour, drain off the water and then chop into small pieces. Mix butter, honey, jam and sugar and milk together with mixer for about one minute and then slowly add the eggs and mix until well blended. Then mix in the flour and the bi-carb. Make sure that the flour and bi-carb are well sifted. Mix for a further one minute. Add and stir in the chopped figs really well with a spoon. Put into a well buttered (greased) baking tin. I use a 25 cm round cake tin. Bake for about 40 – 45 minutes at 180 degrees. Cover with a flat baking/pizza tray for the last 10 minutes. Leave to cool in the tin for a while and then turn out onto rack. And then eat it! Little Adrian (L.A.) has been in a quiet space this week. He has been contemplating his life and his world and has been really clear with Master Adrian that he (M.A.) really needs to be the one in control and the one to make all of the decisions for them both. Most of the week L.A. has been thinking about his childhood and how it really was for him. He was lucky, in many respects, to have been raised in the countryside, where he was able to connect to Mother Nature. Much of his childhood was spent roaming the woodlands, meadows and waterways watching and connecting to the wild birds and animals. And now, in the company of a 48 year old (M.A. ), Little Adrian still loves to ‘go bush’; as the expression goes in Australia. I love to spend time wandering, relaxing, foraging and connecting to the many different landscapes. I love to sit and play my didgeridoo in nature with the animals and birds listening, and sometimes watching, on. And I love it that I can take my little boy with me and be there with him. Two weekends ago, I spent a night and the following day in the bush with my 17 year old son and it was just wonderful. Contemplating my childhood and my current life this week, has challenged me to really own the spiritual side of my nature. It is a big part of who and what I am. 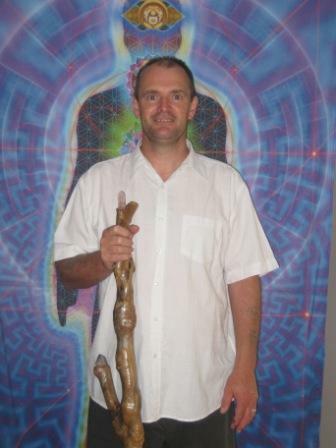 I have always been interested in spiritual matters and can remember, as a young boy, experiencing many things of a spiritual nature, By spiritual, I mean experiences that are beyond what we would consider normal everyday physical events. As a young boy I had experiences of birds landing on me and sitting down beside me and once I even had a squirrel run up my body and sit on my shoulder for about a minute. I also remember seeing ‘ghosts’ or ‘spirits’ and seeing things in the sky. As an adult this has continued and I am still enchanted and moved by such experiences. So, contemplating all of this, my Mother spoke with me this morning and I was touched when she told me that she has read my blogs. 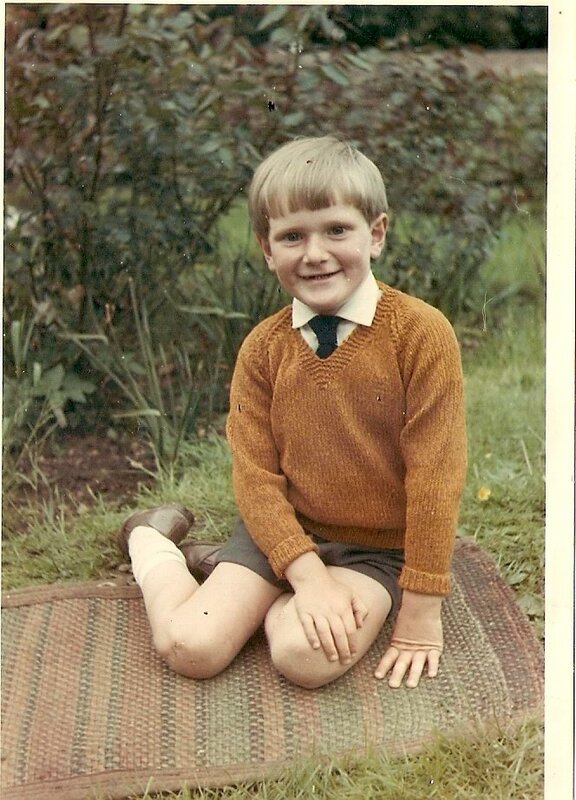 She asked me if it was she or my grand-mother, who had knitted the ‘golden jumper’ that I am wearing in the photograph of me when I was 6 1/2 years old. It was one of my grand-mother’s jumpers. She knitted several for me. When I was a teenager, my Mother knitted me a ‘rainbow jumper’ that I wore for many years. It is these wonderful memories that keep flooding back to me. I am blessed to have such a caring Mother and when I think back to my younger days, I can see that my Mother was always there for me with her loving warmth. Even when I was in my wild Punk Rocker stage, as a teenager, she stood beside me. This morning I was up early and was making a cake by 7.30am. In fact I made two cakes because it is my daughter’s teachers birthday today. We took a cake into school for her this morning with candles and a flower on top. It was a Banana and Chocolate cake. Little Adrian was ecstatic. He was very happy to clean the bowl and lick the wooden spoon clean. So let’s celebrate all that was good about our childhood. Let’s celebrate all that is good in our life Right Now! Follow this recipe and let’s all have one big cake eating celebration right across the globe. 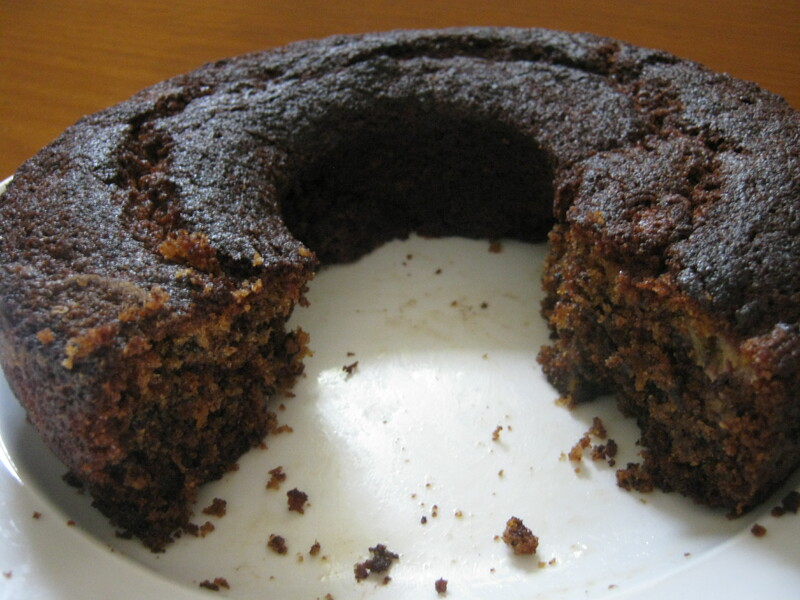 Let us call this the ‘Banana and Chocolate – Life is Good – Cake’. Ingredients: 125 grams butter, 180 grams (castor) sugar, 2 eggs, 150 grams self-raising flour, 1 teaspoon bicarbonate of soda, 2-3 bananas, 60 – 80 grams of (grated) chocolate. Icing sugar for dusting is optional. Method: Mix butter and sugar together with mixer and then slowly add the eggs and mix until well blended. Then slowly fold (mix) in the flour and the bi-carb. Make sure that the flour and bi-carb are well sifted. Add and stir in the mashed bananas and the grated (organic yummy) chocolate. Put into well buttered (greased) baking tin. I use a 23 cm round ring tin. Bake for about 30 – 35 minutes at 170 – 180 degrees. Leave to cool in the tin for a while and then turn out onto rack and dust with icing sugar if you wish to once the cake is cool enough – if you can wait that long!